The simplest way to add a bit of texture to a piece of plain knitting is to include stripes of fancy yarn. Here I included the gorgeously soft & fluffy Belangor French Angora, which really makes these pop! This pattern is one that I use for teaching the Magic Loop method of knitting in the round and simple paired increases and decreases. 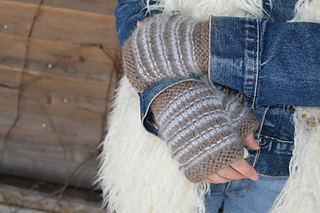 Quick to knit, these mitts make a perfect gift for a special friend – or keep them all for yourself! Designed to be worn with the matching Cinnamon Loop Hat.